Pope Benedict XVI celebrated Easter Mass in Saint Peter's Square Sunday and made an impassioned appeal for world peace in his traditional "Urbi et Orbi" message. He spoke of his concerns for Iraq, Afghanistan and Africa. 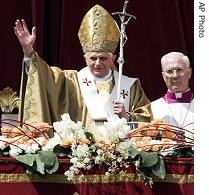 Tens of thousands of people were gathered at the Vatican for Pope Benedict's second Easter. Sabina Castelfranco reports for VOA from Rome. Pilgrims and tourists from different nationalities crowded into Saint Peter's Square for the second Easter Mass celebrated by Pope Benedict. A sea of flowers adorned the steps of the basilica. Bells peeled and then the sound of the choir rang out across the square. The pope appeared in brilliant golden vestments to preside over a joyous celebration on Christianity's most important feast day, which marks the day Jesus resurrected three days after his death. At the end of the mass, the pope addressed a huge crowd from the central balcony of Saint Peter's Basilica overlooking the square. "Christ is risen! Peace to You!" he said at the start of his Easter message to Christians all over the world. Then, the pope made an impassioned appeal for world peace. Pope Benedict lamented the slaughter in Iraq and the growing unrest and instability in Afghanistan. "Nothing positive comes from Iraq," he said, "which is torn apart by continual slaughter as the population flees." But the pope did note that there are some signs of hope in the dialogue between Israelis and Palestinians. Speaking of the church's concerns in the world, he said, how much suffering exists with natural calamities and human tragedies that cause innumerable victims and enormous material destruction. The pope mentioned the scourge of hunger, of incurable diseases, of terrorism and kidnapping of people and of the thousand faces of violence, which some people attempt to justify in the name of religion. The pope also turned his thoughts to the African continent. Pope Benedict mentioned the catastrophic and underestimated humanitarian situation in Sudan's Darfur region. He spoke of the violence and looting in Congo, which raises fears for the democratic process and reconstruction of the country. The pope also said that renewed fighting in Somalia has driven away the prospect of peace and cited Zimbabwe, saying the country is in the grip of a grievous crisis. Thousands listened to the pope's words in a sun-filled Saint Peter's Square. Millions more watched him on television as he wished the world a Happy Easter in 62 different languages. Pope Benedict now heads to the papal summer residence at Castelgandolfo, in the hills south of Rome, for a few days of rest. When he returns to the Vatican, the pope has two important dates on his calendar: his 80th birthday on April 16, and the second anniversary of his election as pope three days later.